As soon as architects have established their practice and working flows based on advanced CAD systems, already the concept of Building Information Modeling was introduced. Additionally, uncounted possibilities have been expelled for collaboration too, which go far beyond the communication by e-mail exchange, file repositories or video conferencing. For example, multi-user platforms such Second Life has been proposed as interesting option for real time collaboration or education. Second Life – which, based on Linden Lab’s report Q1-2009, claimed to have around 40.000 users being on-line at each given time and making total user-to-user transactions of $120 million USD in first quarter of 2009. Linden Lab developer of Second Life describes it as “a 3D online digital world imagined and created by its residents”. It is Internet-based service, and Linden Lab just keeps maintaining the server-side framework. It presents itself as rendered virtual environment and multi-physic simulation. Users control avatars that can interact as in real life, buy and sell virtual products, acquire virtual real estate and design and build virtual objects. Using simulation platforms like Second Life for virtual prototyping (products, buildings and urban settings) is a very sound concept. Many efforts exist, as well, to change from closed and proprietary software systems to rather open-source oriented frameworks within design advancement. 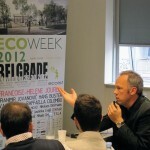 The idea is to introduce performative simulations of design proposals for overall quality insurance – i.e. exploring, analyzing, and evaluating ideas toward possible realization in real physical environments. “Concurrently, virtual worlds are rapidly growing in scale and sophistication, attracting investment to support research and development, and increasingly becoming sites for everything that can benefit, in some way, from taking place in online virtual environments – mirroring, role playing, reconstruction of the past and many useful forms of prototyping.” In a competition to specialized domains of computer-aided design and engineering simulation, a much broader community, effective combinations of modeling and simulation with social interaction and exchange capabilities can be produced. “It seems likely, then, that virtual prototyping will become a specialized interest of sub-communities within the larger communities supported by virtual worlds” (Mitchell, 2008). Fig. 2 shows screenshot from the Sim ORTLOS showing the project “City Lab”. However, Second Life has issues of its own. Although it has released the client as an open source, it has not yet released the server as open source (Stand April 2009). This makes intellectual property a problem. For example, say an individual creates clothes for an avatar in Second Life and sells them (and many people do). Now say this same individual leaves for some reason Second Life, even though it was the specific individual who created the clothing they are unable to use them in another environment – this is true of any intellectual property that they might have developed. Another problem is that Second Life is a closed system – until now it was not possible to export or import geometry e.g. into a CAD system. There is no annotation system (expect of note cards) and it has poor document handling with complicated user rights definitions. 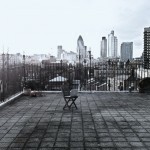 Therefore, the development of OpenSim found a great interest by many developers. OpenSimulator (description found at developer’s web site) is a 3D Application Server: “which can be used to create a virtual environment (or world) which can be accessed through a variety of clients, on multiple protocols.” OpenSimulator allows user to develop own environment and to build completely custom configurations. OpenSimulator is released under a BSD License, making it both open source, and commercially friendly to embed in products. 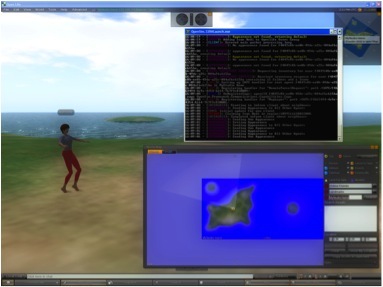 OpenSimulator can be used to simulate a virtual environment similar to Second Life. Supports creating multiple ‘worlds’ in a single application instance. Supports multiple clients and protocols – access the same world at the same time via multiple protocols. Realtime Physics Simulation, with multiple engine options including ODE, PhysX, Bullet and more. Fig. 3 shows a screenshot from Ortlos Open Simulator Server by author. As well as server also the client runs on local workstation. With public IP this Sim is accessible from any computer connected to the Internet. The most important advantage of Open Sim is that the user is not limited by any means through service provider such as Linden Lab. Another promising platform is under active development by Sun Microsystems and the open source community. Project Wonderland, as Sun describes it, is a 100% pure Java, free and open-source toolkit for building 3D interactive virtual worlds. 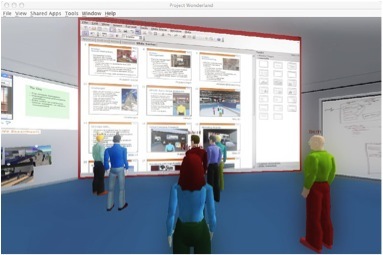 It is a 3-D scene manager for creating collaborative virtual worlds. Within those worlds, users can communicate with high-fidelity, immersive audio and can share live applications such as web browsers, OpenOffice documents, and games. Fig. 4 shows screenshot of collaborative Workspace MPK20 from Project Wonderland by Sun Microsystems. One important goal of the project, according to Sun, is for the environment to be completely extensible: “developers and graphic artists can extend the functionality to create entire new worlds, new features in existing worlds, or new behaviors for objects and avatars. The goal of Wonderland platform is to support content creation within the world, but in the shorter term, the goal is to support importing art from open source 3-D content creation tools as well as professional 3-D modeling and animation applications.” According to Sun’s development roadmap, the options for world assembly and geometry import will be soon significantly improved – e.g. the Collada (plug-ins for specific software ColladaMaya, ColladaMax, etc.) and X3D (successor to the VRML) file formats will be enabled. The idea here is a multi-agent model to virtual world platforms in which an avatar, a visual representation of a user, is a part of collaborative network. 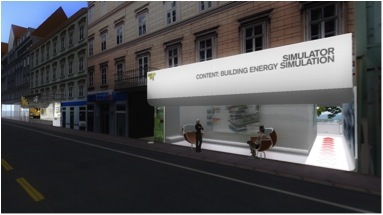 The platform itself should be an enabling environment for multi-physics simulations and architectural digital mock-ups (virtual prototyping based onperformative aspects) as collaborative environment. It is envisioned that Open Simulator platforms in future will not only be used for employing the representational aspects of simulations, but truly support behaviors of real life environments in the full capacity of their complex nature. One possible scenario is the emergence of networked environments such as those of the Open Simulator which could support cross-organizational collaborative working processes. In such environments, agents will have the ability to learn the rules and regulations for participation through interaction with other agents, rather than being pre-defined as these cannot be determined in advance. Those systems will be designed based on web services and services-oriented infrastructures, supported by emerging, commonly agreed, design strategies and much more mature ontologies. 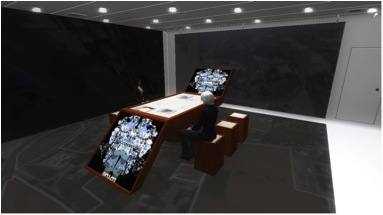 Further information and readings can be found at ORTLOS web page dealing with Second Life and issues connected to virtual worlds in context of design platforms. 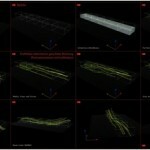 “COLLADA is a COLLAborative Design Activity for establishing an interchange file format for interactive 3D applications. COLLADA is managed by the not-for-profit technology consortium, the Khronos Group. COLLADA defines an open standard XML schema for exchanging digital assets among various graphics software applications that might otherwise store their assets in incompatible file formats. COLLADA documents that describe digital assets are XML files, usually identified with a .dae (digital asset exchange) filename extension” (Wikipedia, April 2009).